YOU can nominate your fave money blogs for an award. Nominations are now open for our fourth annual SHOMO awards in association with Quidco. 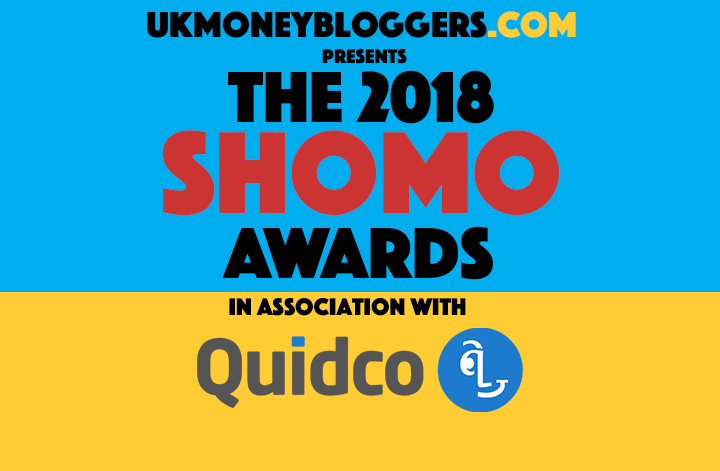 If you’re a money blogger, the SHOMOs are your chance to get some recognition. Most blogging awards put all money bloggers together – if they’re not lumped into a lifestyle category – but the SHOMOs give us a chance to celebrate our specialisms, and showcase the breadth of topics we write about. The winners will be announced at the Show Me The Money Bloggers 4 conference on November 17th 2018. I’m delighted that Quidco has returned as the main sponsor for the awards, and Zeek will once more be providing the prizes. We’ve also got Sainsbury’s Bank, Yolt, Awin, Experian, Schroders, Widget Maker, Idealo, PensionBee and Lansons on board as individual award sponsors. A big thanks to all of them. If you’re a brand keen to get involved with one of the remaining awards and attend the event in November please email [email protected] for more information. All awards are open for public nominations except Money blogger of the year, People’s choice and Best designed money blog. These are shortlisted by the SHOMOs commitee. For the remaining categories, nominations close on 5th August 2018 and finalists will then be asked to submit links and supporting material for the judges to consider. Just fill in the nomination form at the bottom of the page by entering the web address of the blog you think should win the category. You can nominate your own blog. You don’t need to enter a nomination for each category. Depending on the number of entries in each category, a shortlisting process may be undertaken to produce a list of finalists, but the number of people who nominate you WON’T be taken into account. This means there is no need to ask people to nominate you. In fact, please don’t do this if you’ve already nominated your blog. For the purposes of the SHOMOs, a blog is a written article which reflects or shares the writer’s experiences or expertise. Only posts published between July 1st 2017 and June 30th 2018 are eligible. The blog, vlog or podcast must have published at least one post a month in this period. The top blogger of the year. The judges will be able to select their favourite blogs from all the winners and runners-up, with the top blogs forming the Money Blogger of the year shortlist. It’s more than just about content, we’re looking for people who embody the UK Money Bloggers ethos. You cannot nominate for this award. All the nominated blogs will be automatically be entered into the People’s choice award. Readers will then get to vote for the blog which they love the most! One for the newbies. As long as the blog is about money and was started after July 1st 2017, it’s in with a shout. We’re looking for a standout article that either entertains or informs. Did your readers really get behind it, or maybe you broke news? Who posts the articles that help you spend less? Let us know your nomination for the site that regularly cuts your costs through tips, deals, competitions, coupons or freebies. Who has the tricks and tips to boost your budget? Blogs which primarily focus on Matched betting and not other side hustles will not be considered, so please don’t nominate them. These bloggers should know their stuff – and help you make decisions when saving and managing money, covering topics such as banking, bills and savings. Family finances are a popular topic for readers. Nominate the blog which helps you make the most of your budget while raising kids. Filling the fridge is a big expense, which is where the frugal foodies can really help us dish up tasty meals on a budget. One for the blogs that help you spend as little as possible. Nominate the blogger who helps readers get by with thrifty tricks and frugal tips. This is the serious stuff. Who’s helped you make the big decisions on investing and your future? From debt to the environment and from fashion to travel, who’s cornered the market in money blogging for a specific audience? Tell us your top podcast on all things money. Who has entertained and informed you the most through video? Who uses social media the best? From Instagram to Pinterest, via Facebook groups and Twitter. There are some great blogs out there run by companies, charities or brands. Nominate your favourite here which is too big for our independent categories. Now, get nominating! Remember nominations close 5th August 2018.